925 Sterling Silver Jewellery – Silver Standards & Silver Care Advice. All of the silver jewellery at Silver Chelles bears the mark of 925. 925 is the accepted sterling silver stamp of most countries. It indicates the purity of silver in the hand-crafting of the piece. 925 Sterling Silver means that the silver is 92.5% pure silver. 100% pure silver is regarded as too soft to make jewellery with. So the remaining 7.5% will be an alloy which is added to give the silver strength. We recommend that you clean your Silver jewellery with special Silver Polishing Cloths available at most jewellers. These cloths are impregnated with a natural polishing compound and have anti tarnish properties. A quick gentle buff will bring the sparkle back to your precious jewellery and make them shine like new. 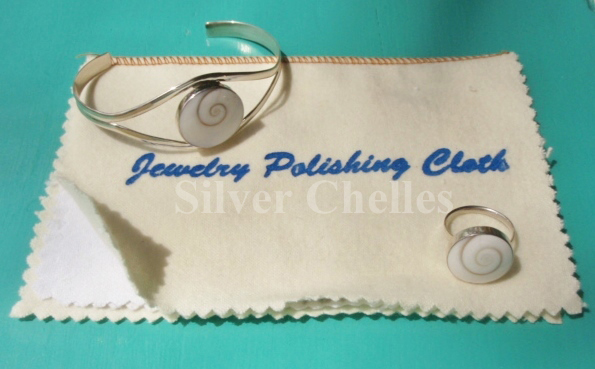 We do not recommend silver dips or liquid cleaners as our jewellery incorporates natural shells. These can be easily damaged by these harsh chemicals. 925 Sterling silver reacts naturally to air and moisture and will tarnish over time. To prevent your individual Silver pieces tarnishing so quickly, store them individually in little air tight zip lock bags. Your jewellery will also then be protected from scratches and scuffing.